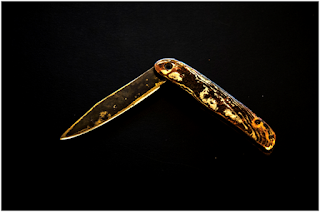 Folding knives, because of their moving parts and intricacies, have always been a daunting challenge after making solely fixed blade, full tang knives. 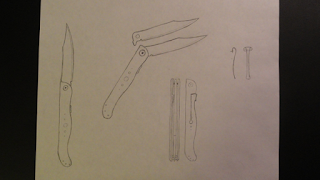 Several months back, a disparaging amount of time having passed between then and now, I began to design a small folding knife for a friend preparing for deployment. At the time, I thought it would be simpler and easier than when I actually began to delve into the operation. 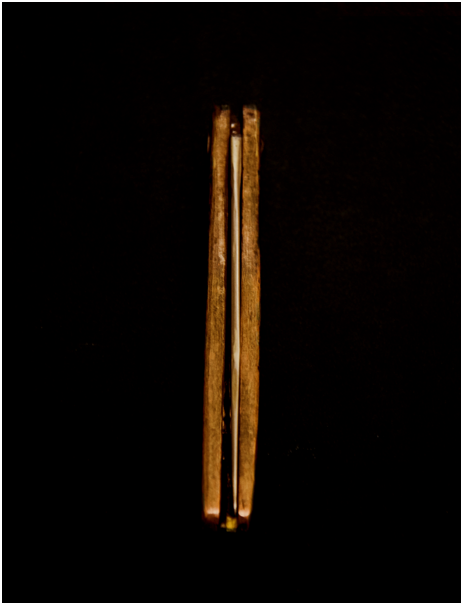 The original design involved a side spring locking mechanism as might be found in commercially available pocket knives. My reasoning for this approach was that it is simpler (in theory) than a lock that slid into place at the spine near the hinge or a thumb knob lock to prevent it from opening past 180 degrees. Traced from the pattern onto a sheet of aluminium, I cut the pieces to be used as scales in the frame rather than steel due to the blade's constant exposure to the salty air of the oceans. 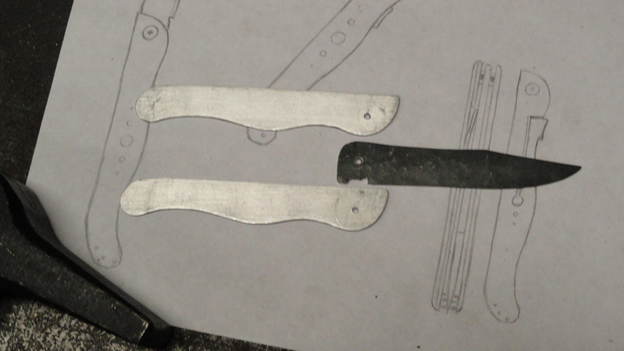 With the pair as a template, another piece cut into the same shape, this time of 15n20 steel for the spring. With a combination of files and the belt sander, all three matched near perfectly and it was time to move onto forging the blade. 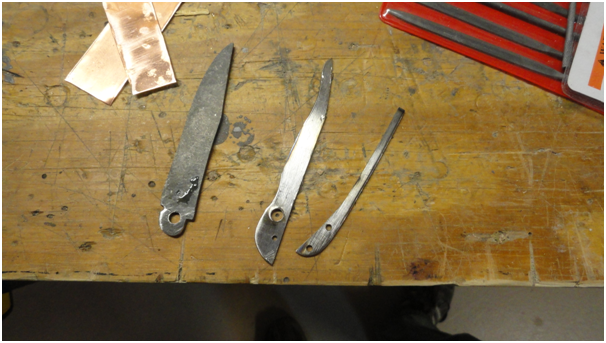 While I could have continued with finishing these pieces, I decided to wait until I had the blade forged and heat treated before getting carried away. The blade is, after all, the most defining piece for me to make, and I find it easier to cut new scales rather than going through all the trouble of forging and finishing a new blade to fit these if the first one is slightly askew. From a piece of 15n20, I began to draw out the profile. 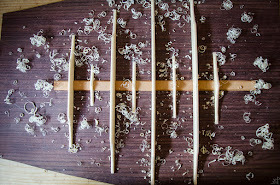 However, this particular piece of stock was too thin for the final design, so I had to reduce the width to compensate. 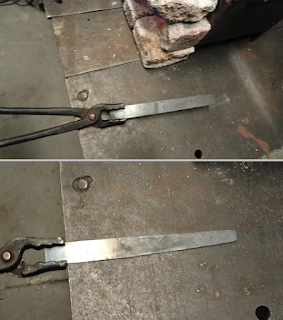 Not a difficult operation, but careful none the less to ensure flatness and no twisting with a dished anvil face. With a somewhat uniformly shaped bar, I curved it along the length so I could draw the edge with a bevel to straighten it back out. 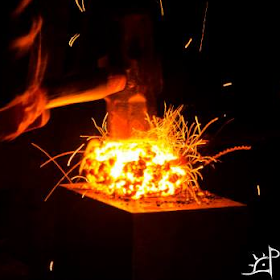 I prefer to forge in bevels rather than grind them for the simple reason I enjoy the hammer and fire over the whirr of a motor even if it takes longer in the end. Tip formed and slight upset along the edge to define where the blade ends, this is about all I was able to do with the hammer. Cut free of its parent stock, the blade takes a few minutes with a file to clean the corner and define where the edge ends. This is the first point where I made a fatal mistake. I should have forged the thumb piece longer, so it protrudes past the bottom of the handle while closed. As it is here, it is useless. In later steps, I will remove it entirely. Marks to find the centre for the hinge allow me to drill the holes more precisely than by winging it (something I do all too often). Instead of using a drill size for the final pin diameter, I kept it small for the simple reason of not having the physical pin yet. While I could have drilled it to .25" or some such dimension, I know from experience that this is a bad idea. So, I left it this small and used a nail for holding it together temporarily. This, however, is when I decided I did not like where the project was headed, so I scrapped the design realizing I do not have the proper tools to finish it as I intended, and that the dull aluminium scales are unattractive and boring. So, I returned to an old favourite. 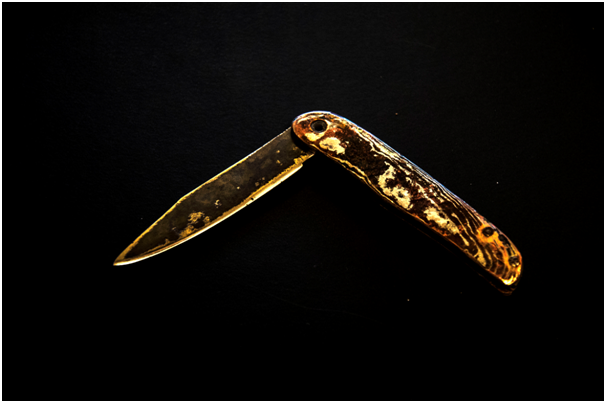 Mokume-gane. 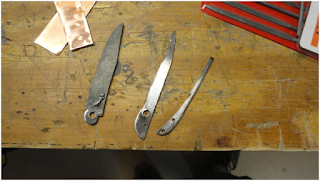 The intent was to use a piece of scrap damascus for the blade and newly forged mokume for the scales. This lasted only as long as it took to walk outside and feel how cold it got overnight. Fortunately, I had forged the mokume the day prior, and instead of waiting around for the weather to turn, I decided to use the old blade. First came construction of the spring. This was an experience in itself, resulting in a little improvisation. At first I cut the spring too long, so I shortened it on the belt sander. 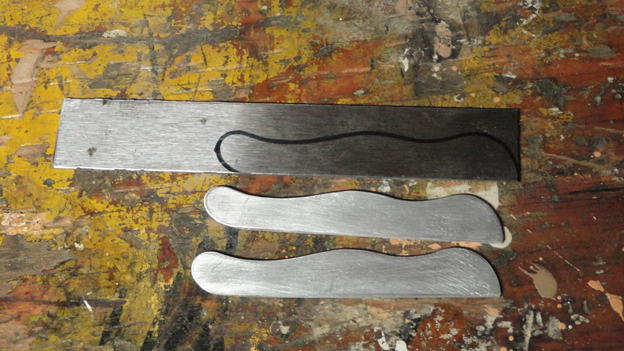 Now it was the wrong shape, so I bent it over a small rail road track anvil until it matched the scales better. And, of course, it was too short. 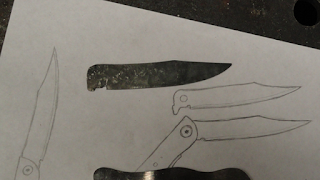 Instead of cutting a new piece, which began as the original side opening spring blank, I realized that I could simply draw it out with a hammer. If ever there is a way to recycle old materials instead of wasting new, I do my best to use them. Here, it worked out well enough, and in the end I do not think it would have been any better to start the spring over. 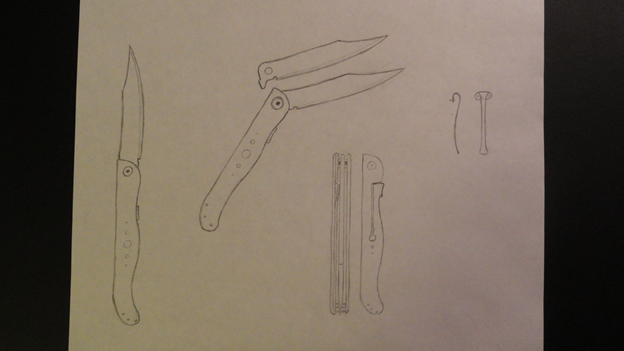 In fact, by drawing it out in length I also made it slightly thicker, which was for the better. 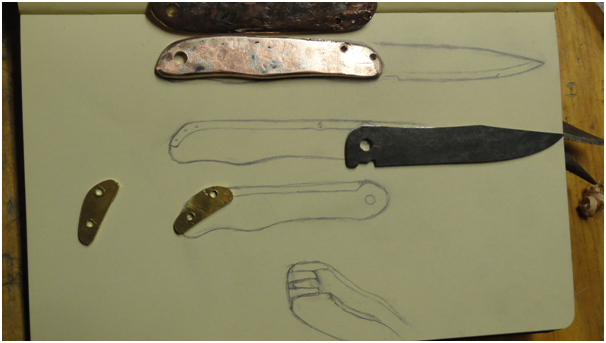 Those little brass pieces two pictures up came next, as well as the holes in the blade and scales. Those were sized for the bushing I picked up in a rather spontaneous hardware store trip. By this point, it has been several months (January) since I first began, and I did not want to delay by ordering something online with the possibility of getting it wrong, having to order new parts, etc. So, I brought the scales and blade with me and sized them on the spot. With said hardware, a collection of the smallest screws I could find, which were still far too large in retrospect, nylon bushings and washers, lock washers, nuts, bolts for the hinge, amongst other things. 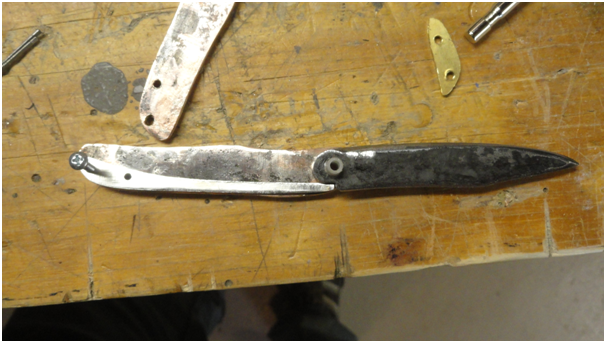 Spring cut, I drilled holes in it and the brass to match holes in the scales where the back end would be held together by two screws. My intent was to use the relative hardness of the screws compared to the soft copper and nickel of the scales and brass of the spacers to my advantage. By drilling an undersized hole, I could thread them by screwing the screw into it with a little work. What I did not know at the time is how weak the screws actually are. Everything was going fine and well, until I felt a dramatic change in resistance. For those of you who do not know about material science, I will explain the phenomena. Metals (and everything else for that matter) can experience a certain amount of stress and remain physically unchanged. Imagine a tensile spring. Pull it apart a few centimetres and release. It characteristically springs back into its relaxed shape. Now, pull it ten times as far, and when released it is still a little deformed by the process because its elastic limit was exceeded, and now it will return only to that point rather than fully compressed. Next, pull it and do not let go until it is fully straightened and farther. The fibres of the spring themselves are beginning to separate, and if you do not stop soon, it will break into pieces. Apply a similar idea to the head of a screw, the weakest part. It can take only so much, and repeated pushing of its elastic limit will eventually find the yield point, and not long after, failure. In my case, the steel failed at exactly the wrong time. I felt the resistance spike and then fall rapidly, and I knew the battle was lost. 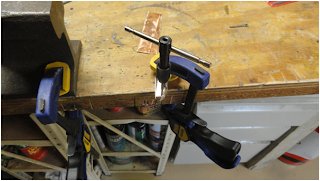 As I tried to reverse and unscrew it from the newly threaded holes, the head of the screw sheared right off, connecting the two scales, the unhardened spring, and one of the two brass spacers. Fortunately, I was able to hold the bottom scale and rotate the rest of the pieces around until they came clean, but that left the screw embedded in that bottom scale. As I took a pair of pliers to it and tried to manually twist it free, the same thing happened again. Now only the barest millimetre of screw remained out of the scale. I could not leave it there, and I could not drill a new hole. Doing what I could, I drilled through it and hammered it out with a centre punch, which tore the inside and caused some delamination. Back to the belt sander. Feeling the bitterness of defeat, I tossed aside the remaining screws of the bunch and went back to the hardware store to find a tapper (pictured above). Taking the holes slow and with plenty of cutting fluid, it went much smoother than the first attempt, and now the pieces all fit snugly together. With the holes in place, I refitted the spring with the blade in place for an alignment check. To no surprise, it was not the same as the first time. Bending it a little more and elongating it slightly, it fit with no overlap and held the blade snugly while open without letting it overextend. Up to this stage, I had troubles with the spring sliding to the sides as it opened, falling out of alignment. To rectify this, I removed first one then both of the nylon washers between the blade and scales at the hinge. 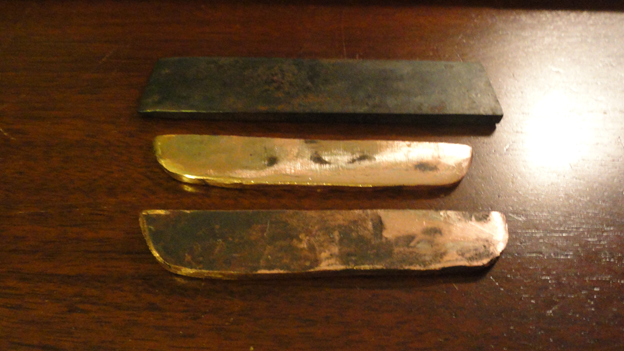 Since this also reduced the thickness there significantly, I also had to take out one of the brass spacers. Not a huge issue, but made it asymmetric. In the end, no problems there. When perusing the hardware store, I imagined the head of the screw and the opposing bolt to be much thinner. No good. It is just plain ugly sticking out so far, and the original lock washers were too thick, so I made my own out of brass. Still too thick, so I removed those later also. At the tail end, the screw heads jutted out just as far and just as painfully hideous to look at. That was fixed quickly with a saw and the belt sander. I left a little sticking out of either end and peened it down like a rived to keep it from naturally working itself free over time. In the future, I will use either solid rivets or find screws with a hex head and proper taper so it lays flat. Similarly, I will not use the conventional screws at the pivot. Ideally, I would have gone with a cutler's bolt, but there were none of the right size on hand. 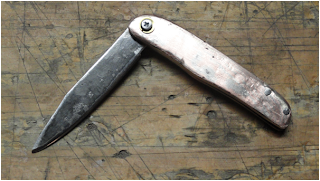 After taking out the pivot screw, I began to experiment with the patina. Unlike every other piece of mokume I have worked, this one could not be separated from the steel while I did it, which meant I could not leave it unattended with acids or the like. The first round, pictured above, was a classic mixture of ammonia and salt. While it mostly worked, there were spots along the bottom screw/pins that did not patinate. In order to fix this, I put it back in the soaked towels and pressed it down with some scrap blocks of steel. To an effect, this worked, but over the following weeks I continued to nurture it into the final state. 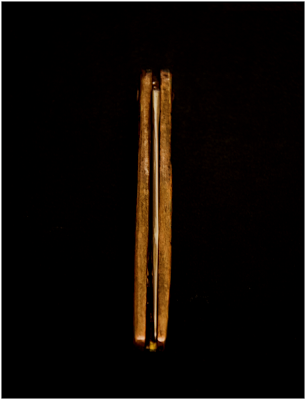 Once out of the patina, small spots of rust began to grow on the spring and ends of the pins. I heard once that this can be corrected by boiling in water, which converts the bad red rust to a safer black. Some repetitions of boiling and drying later, and the problem was solved. 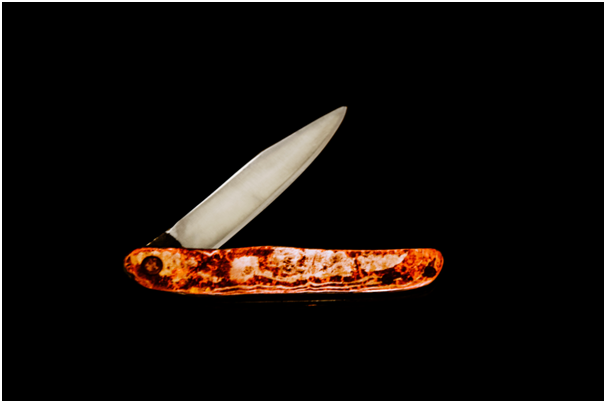 Without a proper pin, the knife sat on my desk ageing for a good many days as I hunted for a rived with a head just large enough to cover the holes for the bushing and a shank of the proper diameter. And then the new belt sander belts arrived. 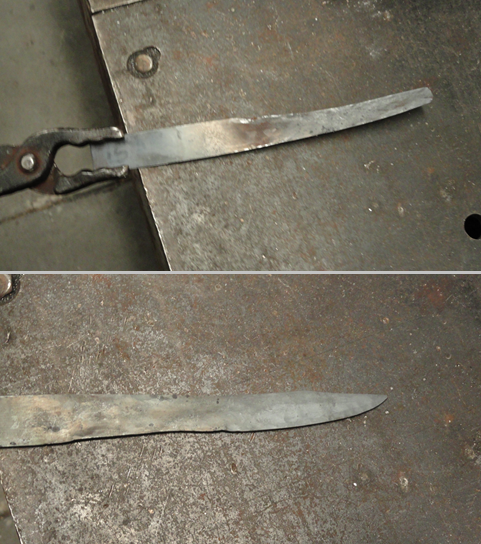 Part of me was waiting for this to finish the blade, as the best one I had left was about as old as the project itself, and couldn't handle the scale negligently left on during heat treatment. Less than an hour later, the blade was sanded smooth and true up to 800# and shaving sharp. While the edge is thinner than I would have liked, it will do. Around the same time, a few days prior, I found a rivet just right for the job. Like a miracle from the forgotten cabinets of fasteners beside the door, it fit perfectly. Trimmed to length and peened down, the fit could not be better. Only, during the process I forgot to put something between the scales to prevent them from closing too much and pinching the blade as it opens. None the less, after working it a few hundred times it is less of a struggle to open, although it is still snug. After several long months and as many transformations, here is the finished knife, and the first folder I have made. I will not say that it was painless, but I enjoyed it and once again found myself amazed at how much I learned through the process. I especially like the Mokume's rings on a tree effect. Good thinking too on the boiling trick, that will save you a bit of grief in the future for sure.